Apr 18, 2019 New release R2018.7 is ready. Mar 15, 2019 New release R2018.6 is ready. Feb 15, 2019 New release R2018.5 is ready. Jan 18, 2019 New release R2018.4 is ready. Nov 30, 2018 New release R2018.3 is ready. Oct 26, 2018 New release R2018.2 is ready. Aug 24, 2018 New release R2018.1 is ready. July 17, 2018 UniPlot is a member of the FEV Group, click here for the press release. June 28, 2018 New release R2018.0 is ready. Apr 06, 2018 New release R2017.6 is ready. UniPlot was developed to visualize and analyze test data. With only a few mouse clicks, you can transform your data into 3D surface maps with color zones, contour maps with color fill, or plot 2D data into diagrams with several axes. Text objects, scanned photos and other drawing and labeling elements can be easily inserted into the document. 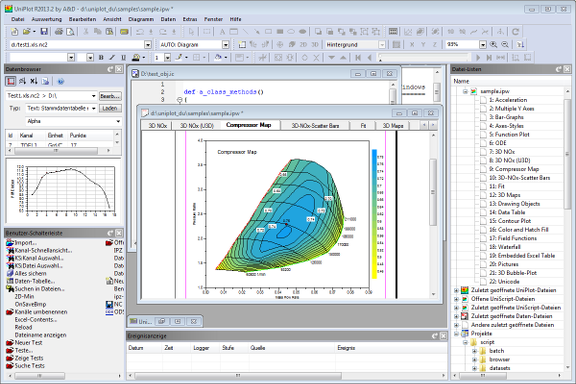 UniPlot offers an efficient and powerful programming language. It enables the user to add new functions to the user interface, to execute complex mathematical data analysis, to import specially formatted data files or to automatically produce complete documentations. UniPlot can be used under Windows Vista/Windows 7/8/10.